Watch former Yale cheerleader Frank Gibson ’49 demonstrate the Long Cheer, a staple at football games for 75 years. Those of you who are Yale College alumni over the age of, say, 70, already know what I’m talking about. The liturgical dancers were performing the Long Cheer, a Yale ritual that was born in the 1880s and survived until—well, we’re not sure, but probably the 1960s, when so many vestiges of Old Yale bit the dust. The two men were teacher and student: Frank Gibson ’49, a former Yale cheerleader, was showing Yale College dean Peter Salovey ’86PhD the fine points of a cheer that was once shouted by thousands at the Yale Bowl. It was O’Connor who organized the Woolsey Hall lesson (which was to be a private one until the Yale Alumni Magazine heard about it and brought cameras). He had seen a photo of Salovey directing the Yale band at a hockey game, he says, and thought, “If he can do that, he can lead the Long Cheer.” O’Connor’s dream is that Salovey will lead a renaissance of the cheer among his student charges. If you want to learn the Long Cheer, watch our video as often as needed. The dean may need to consult it himself a few times between now and football season. Thank you for your article on the Yale cheer. Until now I thought what followed the frogs’ croak was gibberish, but thanks to your commentary, I found both words in my Liddle and Scott Greek-English Lexicon, dated Oxford, October 1871. There was another famous staging of The Frogs in the Payne Whitney pool in 1974 with songs by Stephen Sondheim—and Meryl Streep ’75MFA, Sigourney Weaver ’74MFA, and Christopher Durang ’74MFA in the chorus.—Eds. 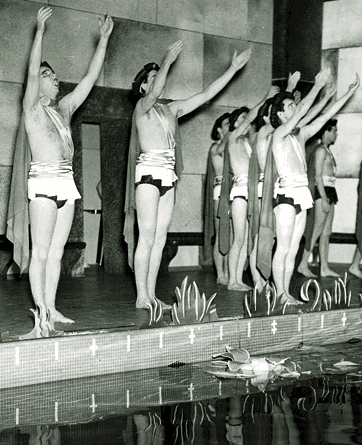 The Dramat stages Aristophanes’ Frogs in 1941. ’nother little job for the coffin maker. Alas, “The Undertaker” is no longer heard in the Bowl. An earlier generation deemed it un-sportsmanlike, said Mother. Surely there’s a small book with the words and music, life and death, of Yale cheers. The Yale Glee Club, which includes “The Undertaker” in its Football Medley, offers for sale a recently updated edition of Songs of Yale that includes a number of traditional tunes, if not cheers.—Eds. Hear the call of the frogs that may have inspired Aristophanes. Read the “brek-ek-ek-ex” scene from The Frogs. Read Judith Ann Schiff’s 1998 column on the origins of the Long Cheer. Read what alumni had to say about the Long Cheer. Send us your memories of the Long Cheer.